Latest Seasonal Assessment - Drought coverage continues to decrease across the Lower 48 states, after a relatively wet winter for many areas. CPC's monthly and seasonal precipitation outlooks, valid for May and May-Jun-Jul (MJJ) respectively, favor large areas of above normal precipitation across the CONUS, especially across remaining areas of drought. These outlooks, a generally favorable MJJ climatology, and a wide array of dynamical and statistical models and tools, support drought improvement/removal over most residual drought areas of the contiguous U.S. The exception is Washington state and northwestern Oregon, which recorded large precipitation deficits (12 to 16 inches) this past winter, unlike most other portions of the West. Although some precipitation is expected during the next few weeks, the Pacific Northwest is rapidly approaching the end of its rainy season, and the beginning of its dry season. 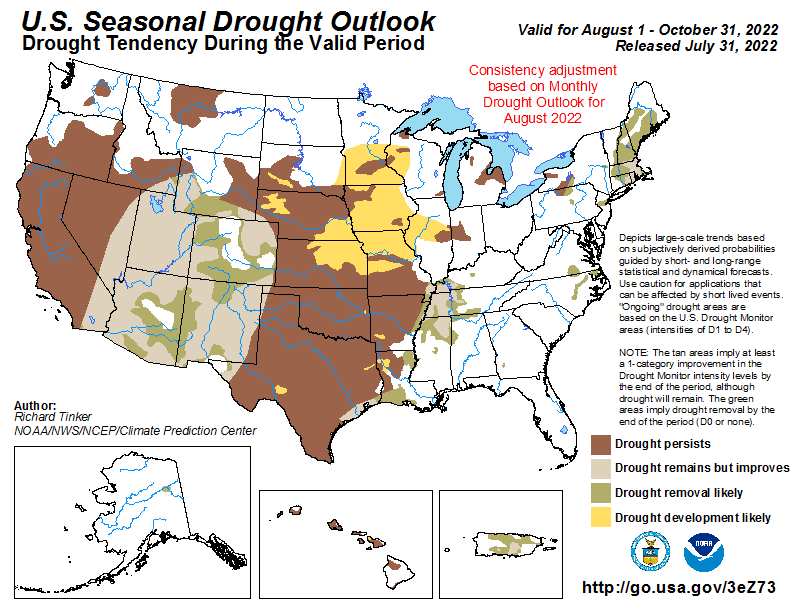 Climatological considerations, in addition to CPC's May and MJJ 2019 precipitation outlooks convincingly tilt the odds towards drought persistence in north-central Washington, with a surrounding region of drought development expected. The dry signal predicted over the Pacific Northwest during MJJ is expected to also influence the Alaska Panhandle region. The southern Panhandle has been in hydrologic drought for many months, and the low reservoir levels have resulted in reduced hydropower production. Drought may extend northward during this MJJ season to include the northern portion of the Panhandle. In Hawaii, the climatological rainy season will soon give way to its dry phase, and this dry signal is expected to be reinforced by a weak El Niño. With increasingly persistent trade winds a common feature during the Hawaiian dry season, leeward slopes are expected to miss out on the heavy rainfall amounts that are usually received on the windward slopes. In Puerto Rico, the northwestern portion of the Commonwealth recently experienced the elimination of drought; but the remaining area of moderate drought (D1 on the U.S. Drought Monitor) over the central part of Puerto Rico is expected to be removed as the climatologically wet MJJ season advances.